Do late hanza flowers turn into fruit? Home / Research / Do late hanza flowers turn into fruit? Deprecated function: The each() function is deprecated. This message will be suppressed on further calls in book_prev() (line 775 of /home/dapkarels/domains/saharasahel.org/public_html/modules/book/book.module). 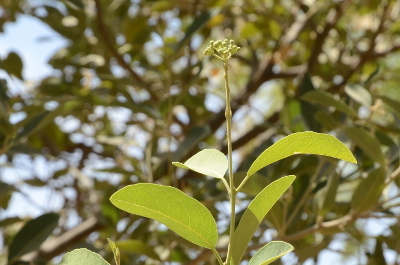 In Niger Republic, the hanza tree (Boscia senegalensis), has its usual flowering period in October-November, at the start of the dry season. Soon after flowering, very small dark green fruits form in clusters of about 4-6 (2-10) units each. But it takes a long time before one can taste the sweet transparent jelly from the ripe fruits. 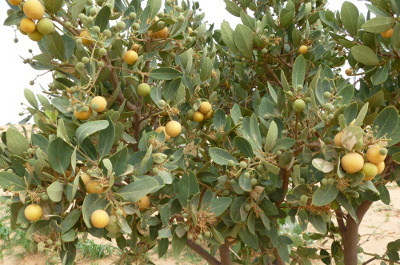 The fruits need practically the whole dry season to develop until they have the size of a berry of about 1.5cm diameter. At the beginning of the rainy season (end of June/beginning of July) the fruits ripen and turn yellow. This slow process is the general cycle. 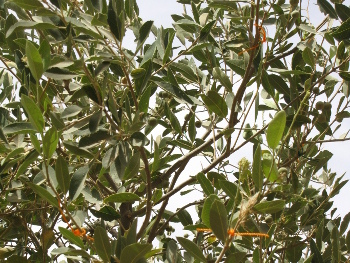 However, there are exceptions to this rule, and some trees can bear fruits with a diversity of sizes, or be flowering and fruiting at the same time. Bakin Birji, 3 July 2012. 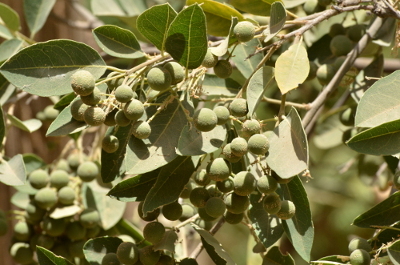 Classically, a hanza tree will contain clusters of homogeneously sized fruits, that have developed from the flowers at the onset of the dry season. 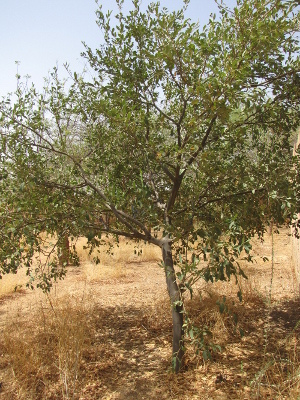 Other examples however show trees where the fruits have started developing at different stages, such as the second case above (picture to the right). Here, big ripe fruits are alternating with medium-sized, small and tiny unripe fruits, as well as with wilted flowers. This is a case where flowering obviously has occurred on more than one occasion. The flowering period is the most sensitive part of the hanza fruit cycle. 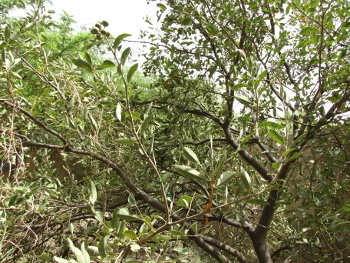 The plant is sometimes invaded by butterflies in the early dry season, that can clear a tree from flowers. This inhibits fruit production and spoils harvests. 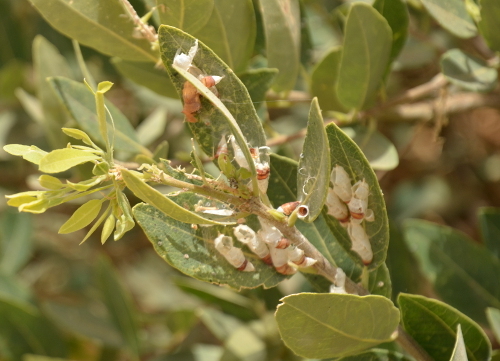 According to local farmers, some of the trees suffering from butterfly attacks will produce no fruit at all at the end of the dry season. But in other cases, the tree may try to compensate partly for the lost flowers by producing new shoots with new flowers on them. 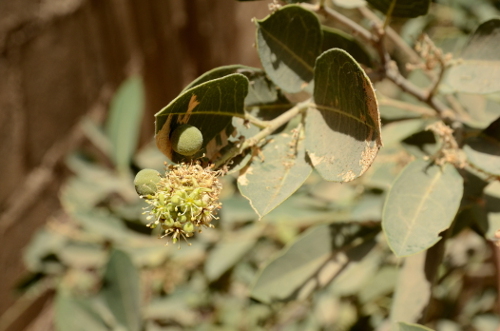 We wondered whether flowers formed late in the dry season still were able to produce full-sized fruits. 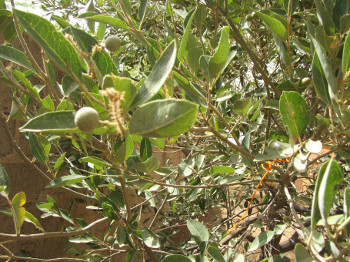 We followed a tree that had many small green fruits from the flowering season in October 2012. 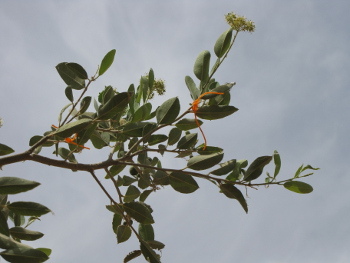 We noticed a number of branches that were developing new flowers in February 2013 and marked them with a green string. 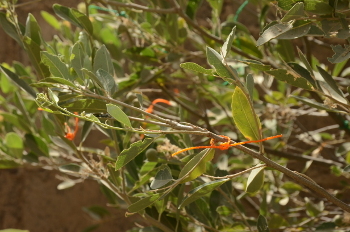 In April 2013 we discovered additional new shoots with flowers and marked them with an orange string. Below pictures of new shoots with flowers which appeared in February 2013. Those pictures are some examples from different sides of the tree. There were more branches with flowers marked with a green string and they were found dispersed in the tree. There was no sign that the flowers only developed at one side of the tree. In April 2013 we marked again a number of branches with flowers in order to be able to follow them up. 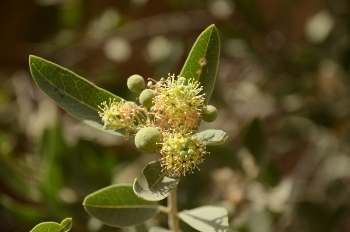 Most of the flowers appeared on a new young shoot that recently had developed, but few flowers were also found on older shoots or in clusters where some unripe fruits were already present. 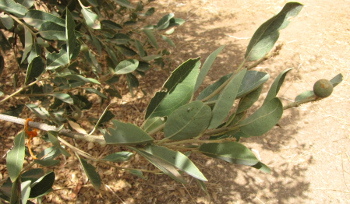 The branches above which were flowering in the beginning of February 2013 and in April 2013 were checked regularly. 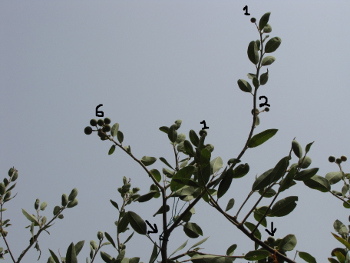 In June 2013 we did a final check to see which of those branches were fruiting, in which amount they were fruiting and if there was difference in size of the fruits from the different flower periods. 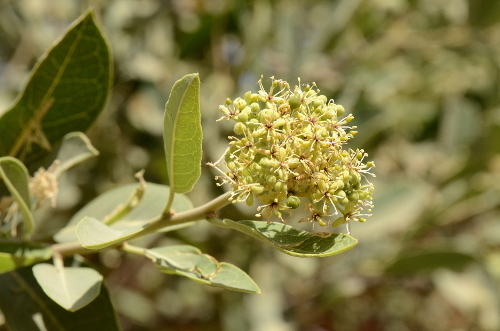 In June the development of the tree types of flower clusters had given different results. 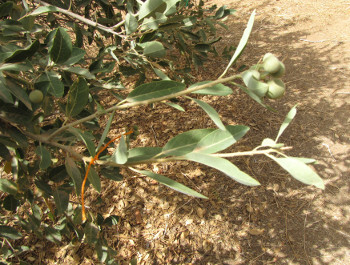 The fruits developed from the flowering season in October were clearly abundant and doing well. The clusters were filled with fruits of normal size. The branches with flowers from February had fruits too, including some good clusters (10 normally sized fruits), but far less than the branches flowering in October. 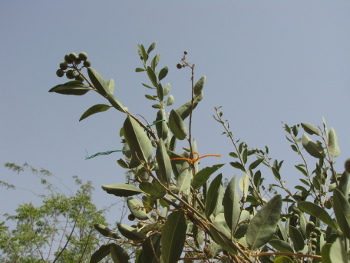 The branches that had flowered in April only carried fruits exceptionally. One here and one there, but most of the flowers from April had simply wilted or disappeared. The fruits that had developed, whether they were from flowers of February or from April, had a normal size. 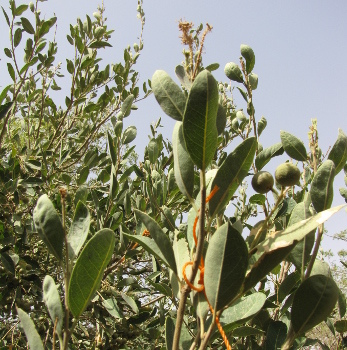 The example above shows us that a hanza tree can very well produce fruits from off-season flowers. 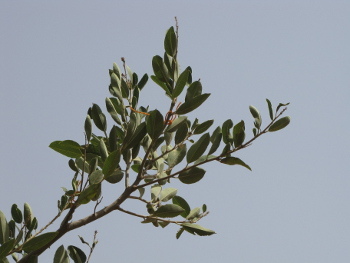 The later the season, the less likely the chance of success appears to be, but the fruits that do survive grow to normal size despite a shorter growth period. Undoubtedly, the best harvest comes from a good flowering stint in the early dry season, and the main threat to this is the eventual invasion of the butterfly. This insect has not been scientifically identified yet. It would be very interesting to learn more about it's identity, it's behavior and it's predators. 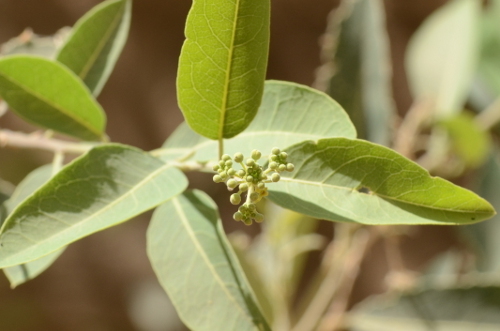 We hope that more knowledge on this species could help develop ecological strategies for reducing damage to the hanza tree's flowers, and thus strengthen yields.